Instructors choosing to incorporate content from 3rd party textbook publishers in their eClass courses or link their courses directly to textbook websites need to be aware of the following policies announced in late 2014. The initial communications linked above were followed by this message from the Interim Provost and Vice-President (Academic). This message is an accompaniment to the correspondence regarding Instructor Use of Online Homework Systems from me that was sent November 24, 2014 to Chairs and also copied to Deans, Vice-Provosts, and the Student's Union President. 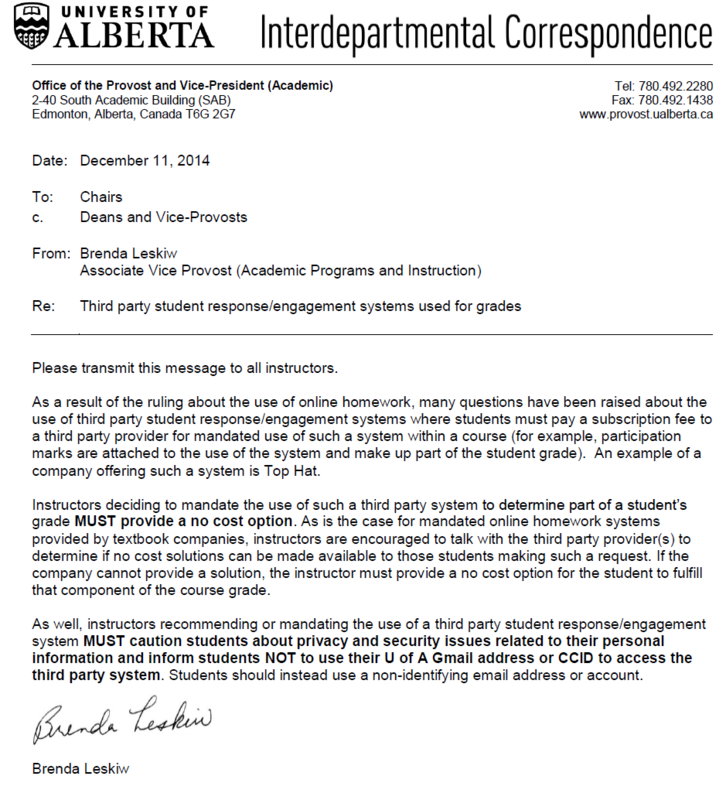 That original message states the requirement for instructors to work with the Office of the Vice-Provost (Information Systems and Technology) and the Information and Privacy Office when using marks from online homework systems (and offering a reasonably equivalent alternative), or otherwise recommending to their students the optional use of fee-for-service online homework systems. Instructors must follow the guidance outlined in the attached document titled "Privacy and Security Guidance for Instructors using Online Homework Systems" when using online homework systems for marks or recommending optional use. Instructors may want to follow the document titled "Instructions for Generating a Random ID" if they choose to provide their students a unique ID with which they should sign up for Third Party websites. Thank you for your prompt attention to this matter. Please direct questions to online.homework@ualberta.ca for transmission to the Associate Vice-Provost (Academic Programs and Instruction).